The megacorp probe race to be the first to reach Halley's Comet is in its final rounds. With only a few contenders left, your shadowrunner team can make a difference, deciding who wins and who loses. Wake of the Comet includes three adventues that wrap up the probe race first detailed in Year of the Comet. Time is running out as the shadowrunners are hired to sabotage the competition and ensure that only one corp reaches the comet first. 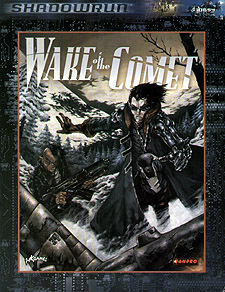 Wake of the Comet is for players and gamemasters of all experience levels.